Los Angeles based glass artist Alison Berger has added a new light fixture to her collection. Inspired by mercury glass and the complex silhouettes of baroque chandeliers, the Mirrored Pendant Chandelier combines these two aesthetics into a contemporary form. To achieve the mirrored effect, Berger uses a technique by which colored glass is oxidized on the crystal’s surface, resulting in a mirrored sterling silver effect, that when lit, illuminates red. 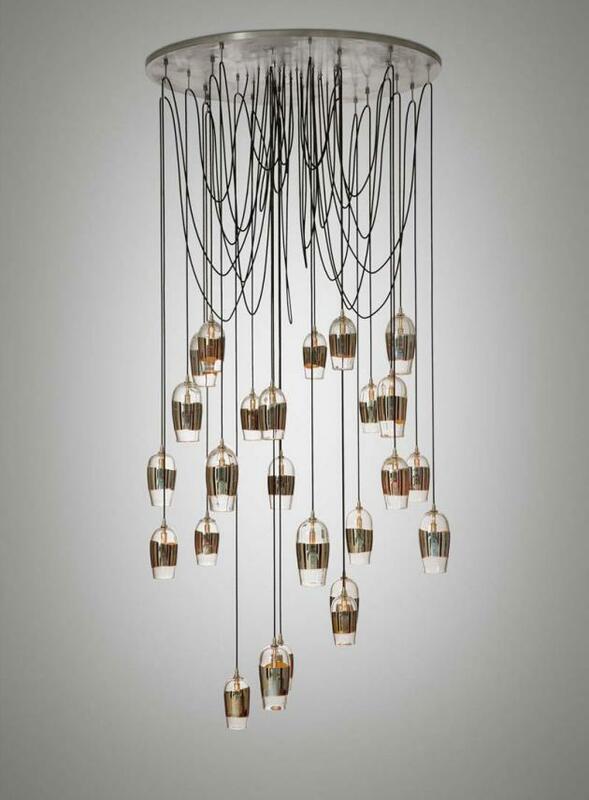 The fixture is comprised of twenty-five crystal pendants in varying heights of 6.5” – 8”. Brushed nickel hardware adds another layer of ornamental detail to the piece. The prototype of this Chandelier is currently featured in Holly Hunt’s Miami Showroom. Visit Alison Berger’s website – here.